You are here: Home / Staying Within Budget / 5 Wedding Shopping Ideas. Tips to Save Money. 5 Wedding Shopping Ideas. Tips to Save Money. We sometimes think a small budget means doing everything ourselves and giving up on the dream wedding. Not necessarily. The good news is the dream can survive the pinch! It will, however, require more thoughtful spending. The key when buying wedding items is to combine DIY projects with discount suppliers, sales or coupon codes, and used items. In a way that not only gets the most value for your money but also keeps your stress levels down. The dream wedding, after all, does not include Bridezilla raising her harried head and ruining your big day. There are various tactics to help you save money on your venue and service providers as well (see Top 6 Tips for Saving Money on Your Dream Wedding), but here I am focusing more on purchased items. #1: Do it yourself ONLY where it makes sense. Depending on your expertise and cost of the supplies, some projects will work out better for you than others. Making your own wedding veil, for example, may cost more than buying it from a discount merchant. For those of you with limited craft skills, you and I are in the same boat; I’m maybe a three on the 10-point craftiness scale. On the couple I had trouble with, I talk about it and show pictures so you can decide if you want to tackle it yourself. #2: Buy pre-owned or slightly irregular where you can. 1. Many used wedding items are in like new or nearly new condition. 2. “New with a quirk” are perfectly good items but cannot be sold as new because they have been opened, don’t have the retail tags on them, and/or have been repackaged. Candles and candleholders are often sold this way. 3. Slightly irregular items are another way to save. Usually, the defect is barely noticeable or is on a hidden part of the product. The seller should note it in the description. #3: Sell or reuse your wedding products. There are others out there like you so, after the wedding, flip tip #2 on its head and sell. When you do this, the wedding-related cost is lower than the price you originally paid. By selling, you get part of your original price returned. By using it in your day-to-day life, you are saving money later. The two most popular arenas for selling are eBay and Craigslist. In my opinion, eBay, with its free Buyer Protection and Buyer/Seller Feedback programs, is the most trustworthy route. If you do choose to sell via Craigslist, put your own safety first by never meeting a potential buyer alone and choosing a neutral but quite public place to complete transactions. #4: Shop a range of stores, including general merchandisers and discount websites. Many times, we are inclined to head to the local bridal store to buy everything for the wedding. This is good because it helps support local business. Usually, however, the prices are higher than you could get online, so the local route may not be doable on your DIY budget. One way to find items from several online stores at once is to use our unique product search engine, which simultaneously searches products from all of our retail and wholesale partners. You can try it by using the search box at top of this page. 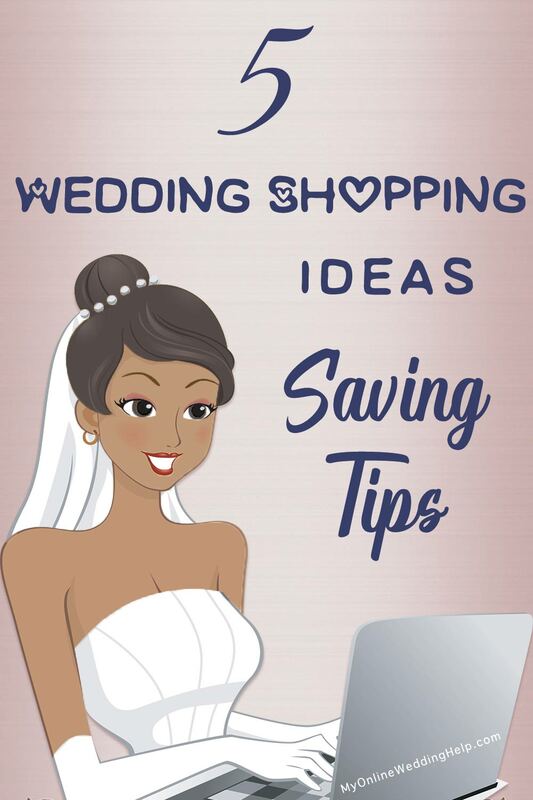 #5: Shop sales and use coupon codes whenever possible when buying wedding items. The ultimate score is stacking savings by using a coupon or other price break on already-reduced items (either on sale or at a discounter/wholesaler). Plan ahead by creating a list of potential supply sources early on, then keep an eye out for opportunities. 1. For brand-name items, be aware of current manufacturer coupons. Even as the number of printed newspapers dwindle, weekend FSIs (free standing coupon inserts) still exist and can contain savings not found elsewhere. Online, there are numerous sources of printable coupons. Be aware that you are usually limited to printing two online coupons at a time. And they are only available until a set number are printed, then will disappear. 2. Individual websites often run coupon codes that are separate from item sales. Get a percent or dollars off when you make a minimum purchase, for example. You can find these advertised online, but often you will find an offer by simply looking for a banner at the top or along the side of the merchant’s site. 3. Sign up for emails and/or download the app from your favorite merchants and monitor deals. 4. Look for discounts earned by using certain payment methods. Credit cards, Google Wallet, Paypal, store credit cards, and Apple Pay are some possibilities that come to mind. Target is a good example of a discount retailer who also lets you save in other ways (disclosure: I am both an affiliate and fan, which means if you make a purchase or sign up for a Redcard after clicking a Target link below, I’ll make a small commission). Their policies allow you to use a manufacturer coupon and their own coupons on sale items (regular-priced items too), then get an added 5% off if you use your Redcard. They also have periodic in-store opportunities to earn gift cards. Stacking all types of savings is rare, but it could happen (I netted down to $4 a bag on $12 cat food one time). Your most lucrative combination, however, will likely be when they run dollars off a party category purchase (FYI, wedding & anniversary is in the party supplies category). Check in the month before any decorative holiday and plan your purchase accordingly, using your Redcard. Looking in the wedding supply items, I found 100 thank you cards and an ivory aisle runner, both nice for a do-it-yourself wedding. The regular price is $76.97, but if I’d purchased during a Halloween sale, which allowed $15 off $75 party supplies, the bottom-line price would have been $58.87 with no shipping charge. That’s about a 24% savings on items that were already a good deal compared to many wedding sources. Plus, no precious time lost driving to the store!